Your music groups are cordially invited to participate in the Allen Performance Experience. The event will be held in the 1,500 seat, state of the art, Performing Arts Center at Allen High School. We have one date available: October 12, 2018 $400.00 per group, $200 additional groups from the same school. These are non-competitive events in which no results or ratings are given. Our goal is to create a positive performance experience in a quality performance setting with a recording. Each orchestra will have (approximately) a 25 minute warm up in the multi-purpose room, a 25 minute warm up on stage and a 30 minute performance time on stage. Please be prepared to stay within that schedule, including entering and exiting the stage. Each group will receive a professional CD recording of their performance, as well as recorded feedback from our panel. In an effort to ensure that groups have an active listening audience, groups asked to listen to other performances if possible. We encourage parents and any other spectators to attend, as admission will be free. To reserve your performance times, please fill out an application form for each group and return it electronically ASAP. Entry fees or a copy of a PO are due by 2 weeks before your performance. Space is limited. Priority will be given to the earliest received entries. Please feel free to contact David DeVoto, david.devoto@allenisd.org, if you have any questions. WE HAVE SOLD OUT! Please email david.devoto@allenisd.org for questions. 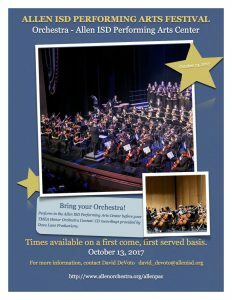 Copyright © 2019 Allen ISD Orchestras. All rights reserved.